Convento da Ordem de Cristo and Monastery of Alcobaca will appeal to history buffs. Discover out-of-the-way places like Castelo de Tomar and Fonte da Telha Beach. There's much more to do: contemplate the long history of Belém Tower, choose your vessel at Lisbon by Boat, contemplate in the serene atmosphere at Jeronimos Monastery, and kick back and relax at Costa de Caparica. 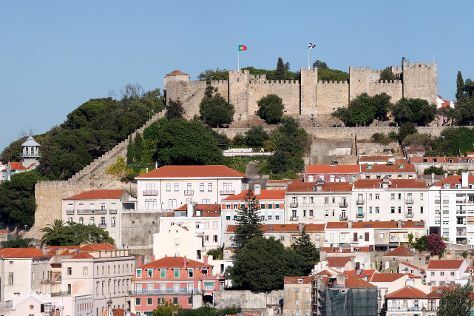 For more things to do, photos, maps, and tourist information, go to the Lisbon vacation trip planner. Newark, USA to Lisbon is an approximately 10.5-hour flight. Traveling from Newark to Lisbon, you'll lose 5 hours due to the time zone difference. In June, plan for daily highs up to 78°F, and evening lows to 61°F. On the 10th (Sat), wrap the sightseeing up by early afternoon so you can drive to Setubal. Setúbal is a city and a municipality in Portugal. Start off your visit on the 10th (Sat): enjoy the sand and surf at Troia Beach. Get ready for a full day of sightseeing on the next day: kick back and relax at Praia do Carvalhal and then tour the pleasant surroundings at Pego Beach. To see traveler tips, photos, where to stay, and more tourist information, go to the Setubal tour planner. Drive from Lisbon to Setubal in an hour. Alternatively, you can take a bus; or take a train. June in Setubal sees daily highs of 79°F and lows of 62°F at night. Wrap up your sightseeing by early afternoon on the 12th (Mon) to allow time for the car ride to Sintra. Start off your visit on the 12th (Mon): admire the landmark architecture of Sintra National Palace. On the next day, explore the historical opulence of Quinta da Regaleira, kick back and relax at Praia de Carcavelos, and then examine the collection at Museu Condes de Castro. To find traveler tips, more things to do, other places to visit, and tourist information, read our Sintra trip itinerary builder. Traveling by car from Setubal to Sintra takes an hour. Alternatively, you can do a combination of bus and train; or take a train. In June, daily temperatures in Sintra can reach 78°F, while at night they dip to 61°F. Wrap up your sightseeing by early afternoon on the 14th (Wed) to allow enough time to drive to Evora. Kick off your visit on the 14th (Wed): take in the spiritual surroundings of Templo Romano de Evora (Templo de Diana) and then contemplate the long history of Convento Dos Loios. On the next day, steep yourself in history at Evora Complex, contemplate in the serene atmosphere at Se Catedral de Evora, then contemplate in the serene atmosphere at Capela dos Ossos, and finally explore the ancient world of Almendres Cromlech. To find maps, other places to visit, ratings, and tourist information, refer to the Evora sightseeing planner. Traveling by car from Sintra to Evora takes 2 hours. Alternatively, you can do a combination of train and bus; or take a train. When traveling from Sintra in June, plan for a bit warmer days and about the same nights in Evora: temperatures range from 86°F by day to 58°F at night. You'll have a few hours on the 16th (Fri) to wrap things up before traveling to Coimbra. On the 16th (Fri), admire the landmark architecture of Mosteiro de Santa Clara-a-Velha and then steep yourself in history at Quinta das Lagrimas. Keep things going the next day: contemplate the long history of Igreja e Mosteiro da Santa Cruz, enjoy the sand and surf at Praia da Figueira (Figueira Beach), and then browse the exhibits of Museu Monografico de Conimbriga. To see traveler tips, maps, more things to do, and other tourist information, use the Coimbra itinerary maker. Getting from Evora to Coimbra by car takes about 3 hours. Other options: take a train; or take a bus. Wrap up your sightseeing by early afternoon on the 18th (Sun) to allow time for the train ride to Porto. You'll explore and learn at Sandeman Porto and Ferreira. Porto Cathedral (Se Catedral) and Santuario Nossa Senhora dos Remedios are good opportunities to explore the local culture. Get out of town with these interesting Porto side-trips: Guimaraes (Largo da Oliveira Square & Paco dos Duques de Braganca), Praia de Sao Jacinto (in Sao Jacinto) and Casa de Mateus (in Vila Real). Next up on the itinerary: enjoy the sand and surf at Torreira Beach, take in the architecture and atmosphere at Cathedral of Santa Maria de Braga, examine the collection at O Navio Gil Eannes, and explore the activities along Rio Douro. To see photos, more things to do, ratings, and tourist information, go to the Porto trip itinerary planner. You can take a train from Coimbra to Porto in an hour. Alternatively, you can drive; or take a bus. In June in Porto, expect temperatures between 73°F during the day and 58°F at night. Wrap up your sightseeing on the 23rd (Fri) to allow time to travel to Ponta Delgada. Popular historic sites such as Nossa Senhora da Paz and Igreja de Sao Jose are in your itinerary. 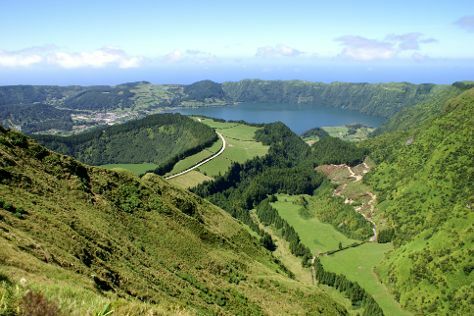 Discover out-of-the-way places like Caldeira das Sete Cidades and Praia de Santa Barbara. Go for a jaunt from Ponta Delgada to Furnas to see Furnas Research and Monitoring Centre about 40 minutes away. There's still lots to do: explore the activities along Lagoa do Fogo, look for all kinds of wild species at Parque Natural da Ribeira dos Caldeiroes, take in the architecture and atmosphere at Igreja do Santo Cristo, and delve into the lush surroundings at Lagoa das Furnas. To see maps, where to stay, traveler tips, and tourist information, read Ponta Delgada tour planner. You can fly from Porto to Ponta Delgada in 4.5 hours. Traveling from Porto to Ponta Delgada, you'll gain 1 hour due to the time zone difference. In June, plan for daily highs up to 70°F, and evening lows to 61°F. Finish your sightseeing early on the 28th (Wed) so you can travel back home.